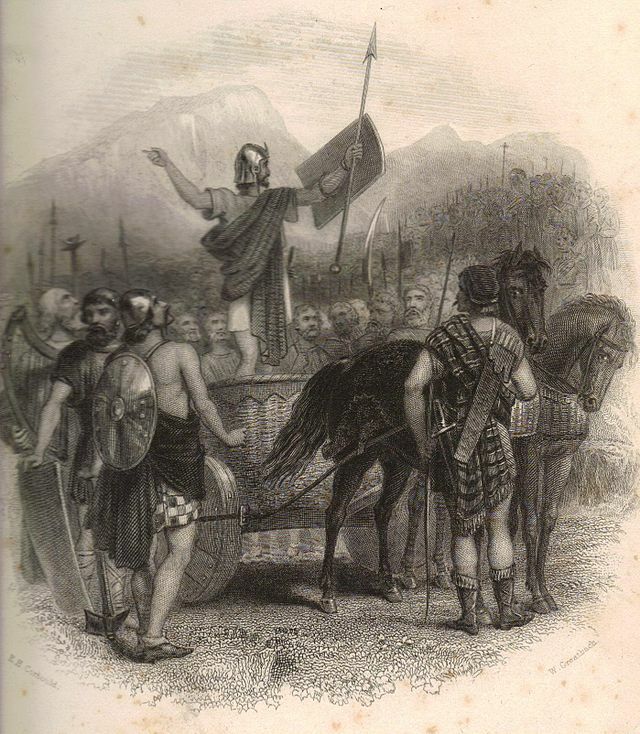 In locating Mons Graupius, the single most important thing is to know the homeland of the Caledonian tribe. Unfortunately, we have no direct evidence for their location but instead must rely on a single map known as the Ptolemy map produced in the 2nd century AD. However, this isn't even really a map, but instead a list of features and their coordinates. When plotted, assuming that coastal features are connected by the coast (they could be islands! ), the map looks like that shown to the right. After examining it, we begin to see that many features are present. We have the two islands of Ireland and the British mainland. Above the Severn estuary is Wales. Below it is the rather enlarged peninsula of Devon and Cornwall. But when we come to Scotland, the map has no resemblance to the geography. However, as we have confirmation from other sources for the name of the Clyde, we can be sure the narrowest part before the map heads dramatically eastward is the Clyde-Forth line. In order to explain this discrepancy, the antiquarians (lowlanders) decided that the map makers didn't know the geography of the Highlands. And so, based of the similarity between the land north of the Forth on the Ptolemy map and the shape of Fife and that of fife and the coast east of Dundee, with they decided that the map must have stopped at the Highland Fault line just north of Dundee where the highland mountains begin. Think about it: the supposed Northern coast of Scotland on the Ptolemy map - a line where land drops to the sea, is equated with one of the most obvious rises in landscape in Scotland. But worse, this theory, doesn't in any way explain why this coast is some four to ten times larger on the Ptolemy map. It is massively oversized. Nor does it explain a host of other problems such as why features identified as Stranraer which are in reality located some 80 miles south of the Clyde and 100 miles south west of the Forth and are located almost due North of of the Forth and North West of the Clyde. For several hundred years the official position was much as the OS map above shows. That the ptolemy map only shows the lowlands of Scotland and so when academics today locate the tribes such as the Calidones/Caledonii (Caledonians) these are in the area of Scotland that it was believed the Ptolemy map showed: the lowlands around Perth or Dundee. As a result almost all sites suggested as the site of Mons Graupius have been located south of the Highland fault line with just a few along the line of forts heading NW to Elgin. So the Highalnd fault line from Loch Lomond to Stonehaven has defined what academics believe is the northern limit of the Ptolemy map and this belief has then defined the places where Mons Graupius was expected to be found. However, despite the numerous suggestions, none of the suggested sites have have any evidence to suggest they were the site of the battle. The "official" location of the "Caledonii"
Everything in this central belt area appears to have been turned around with respect to the Forth. It is only 30-40miles from Clyde to Forth. The Forth and Clyde estuaries are one of the most distinctive features on a Scottish map. How could the Ptolemy map have got these so wrong? The alternative hypothesis - the map was turned. Stranraer south west of the Forth is shown to the North. Well many other people have suggested that Scotland looks like it is turned on its side, and sure enough, if we turn Scotland Anti-clockwise, we see many of the features that we are all familiar with, not least the "nook" of the Moray firth at Inverness. However whilst the map is a vast improvement, Scotland is still to tall and thin. However, the map co-ordinate are in latitude and longitude. And at the latitude of Scotland, one cannot just turn the map and change measurement in latitude to longitude and expect it to be physically correct. Instead, one has to expand the distance west-east and reduce the height north-south. Although the map is far from perfect, it is now a pretty tolerable representation of Scotland. The map has been turned around the Forth on the East coast - which means that the West coast features have to be somehow fitted together. The hypothesis that has been used is that the coastal features are taken from a ships log of a journey around Scotland. It is also assumed that for some reason, this log consisted of a series of bearings and not absolute directions. So e.g. it might have read "we headed out of port for a day and then turned 20degrees to starboard, proceeded another day turned 45degrees to port", etc. As such, whilst the general relationship of each point to the next would be correct, a mapmaker reading this log might not know which direction was "heading out of port" and so have guessed incorrectly. Such a set of directions would also define points along the coast - but if the log were of a voyage along the west coast of Scotland and then to an Irish port, the map maker would not necessarily have known that the new points were on a different coast. What is more important is that a log of a voyage anti-clockwise around Scotland and ending in Ireland would have been longer than the actual journey and would have mentioned additional features, suggesting the distance was greater than it actually was. So, in trying to match up two logs, the mapmaker may have had "too much" on the West coast of Scotland to fit suggesting the map was tilted. Also being a fairly narrow point of the island, even a small extra amount of coast inserted in the West would tend to tilt the map over. Having studied the map of Scotland in detail, there are so many features that match such as the Tavae for Tay and Deva for the river Dee. This then places the very obvious "nook" of the Vara estuary at Inverness. And to confirm this the coast north of the Vara estuary is described as "high", something that fits well with the geography of that area. Moreover, it just makes sense. Inverness has always been a significant population area. This is because it is surrounded by the good farmland of the black isle. This would make them a powerful tribe. In contrast, the "official" placement puts the Caledonians some very poor farming areas with almost no areas for the grains mentioned by Tacitus. And so, now many people are using the "tilted hypothesis" to locate the Caledonians and e.g. if you go to Wikipedia this is the map you are given.